Hal had a different airplane nearly every time we saw him, mostly because he was just interested in airplanes, and partly because he had a knack for crashing them. He was always experimenting to see what his “new” plane could do, or not do; every flight was a test flight. I loved his visits, not least because I always got to go up for at least one flight. It took a while, but I finally noticed that every time we went up, we did something out of the ordinary. At first I thought the steep turns and landings were about giving me some flying excitement, but later I figured out that we were often finding, perhaps for the first time, how this particular airplane behaved. It was The Stall that helped me understand test flights. This is a stunt where you pull the airplane into a steep climb and cut the throttle back until the airplane is just hanging at the edge of flyability, on the edge of slipping backward out of control. It was educational, and a good demonstration of the laws of physics. Then we cut the throttle altogether. The silence was sudden and stunning. The airplane seemed to drift for a second, leaned over, then nosed down shockingly, the propeller foop-fooping lazily. I was mesmerized by that propeller barely turning in the wind as Indiana farmland rushed up to meet us. “That was pretty good,” said Hal. I said nothing. He turned the starter, the propeller became invisible again, and I had an intimation of mortality to contemplate for the first time in my life. “We probably shouldn’t tell them we did that.” I never did. And I never became a test pilot. I’d give anything to fly again with Hal, though. Test pilots have always caught the imagination, and not just with little boys. They were the “Right Stuff” guys in the middle decades of the twentieth century. It’s little wonder that Don the Beachcomber, military veteran and friend of Jimmy Doolittle, would add an item called the Test Pilot to his tiki repertoire. Put everything in a blender (ice last). Blend at high speed for 5 seconds. 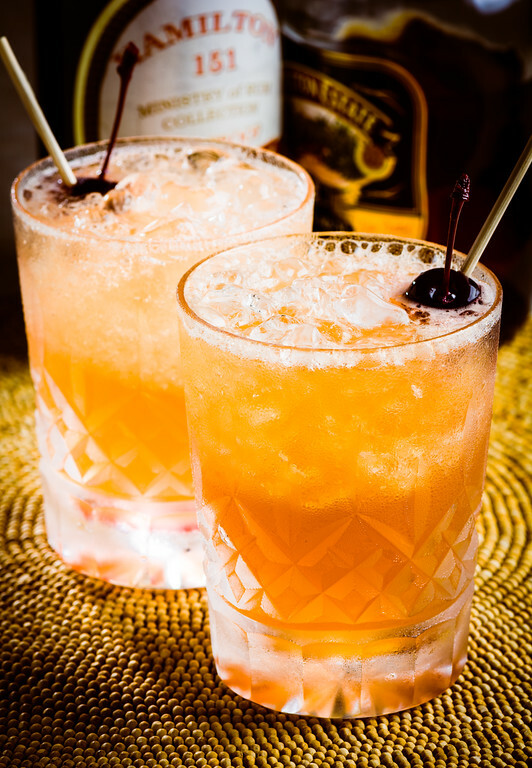 Pour unstrained into a double old-fashioned glass, adding more crushed ice to fill. Garnish with a cocktail cherry speared to a wooden oyster fork. Other than the wooden oyster fork (what th’…? ), this is a pretty restrained formula for Donn Beach. One fruit juice, two rums. The thing that’s intriguing is the Pernod. Its presence is rare in tiki drink formulas. Some who have studied Donn Beach more than I have suggest that the dash of Angostura and the vanishingly small dose of Pernod were the real “secret ingredients” in Don the Beachcomber drinks, the elements that made all the disparate rums and syrups work so well. At mid-century, the Pernod would have been pastis, an absinthe substitute, since real absinthe had been outlawed for decades. Herbsaint would probably be a good alternative. I prefer to use absinthe, since it’s available again, but I don’t think it really makes much difference in this drink. What does make a difference is the amount—much more than the “6 drops” listed here unbalances the drink, but just this tiny amount ties the flavors together nicely. The Test Pilot served as inspiration for other tiki bartenders. They used it as a base for their own embellishments, with names like Ace Pilot, Space Pilot, and Astronaut. One of the most famous, and most successful, of the successors is the Jet Pilot. The Jet Pilot formula is what the Test Pilot should have been. Jeff Berry lists a recipe from the Beverly Hills Luau Restaurant, from 1958. I can imagine the bartenders at the Luau looking at the Test Pilot recipe, wondering if Donn Beach was feeling well the day he invented it, and trying to fix it up so it looks more like a Don the Beachcomber drink. Basically, they took the Test Pilot recipe, added another juice, an overproof rum, and cinnamon syrup, and ended up with something that’s more like Don the Beachcomber than Don the Beachcomber. And Jet Pilot’s popularity eclipsed the Test Pilot; it’s arguably more a part of the tiki canon than Donn Beach’s original. Put everything in a blender, ice last. Blend at high speed for no more than 5 seconds. Pour into an old-fashioned glass. Optionally garnish with cherry. Cinnamon syrup: dissolve one cup of fine sugar in one cup of boiling water. Add 3 crushed cinnamon sticks, turn off heat, and let steep for 2 hours. Strain out the cinnamon and store the syrup in the refrigerator. The addition of grapefruit and cinnamon is brilliant. The cinnamon is the main flavor that stands out in comparison to the Test Pilot, but the overproof rum makes itself known, too. Though it’s only ¾ ounce, the richness of the demerara styling and the kick of extra alcohol give the Jet Pilot some oomph that’s missing from its predecessor. The initial flavor impression is the fruit, and the Jet Pilot’s grapefruit is a welcome addition to the lime. The heart of the taste is the rum, then a hit of the cinnamon. The swallow is sweet, and then there is the lingering fruit and cinnamon in the long taste. It’s interesting that both of these drinks stand up well to slow sipping. There is enough blenderized ice in either of these Pilots to keep them cold a long time, and neither seems to suffer particularly from dilution. I couldn’t help but think of classic punches in that regard—build the drink with a good portion of flavorful spirit, and it simply evolves from being spirit-forward to fruit-forward, but remains a very attractive drink. Particularly with the Jet Pilot, the cinnamon plays a changing role, and seems to become more dominant as the drink warms and dilutes. Both drinks are delicious, but of the two Pilots, the Jet Pilot is my favorite. I think it’s just the little bit of extra lushness, and the touch of cinnamon spice that makes the difference. Both drinks are brilliant blendings of fruit and rum in the classic tiki style. In fact, they’re not so different from other classic tikis or tropicals that we’ve covered before. You could make the argument that they’re just dressed up Planter’s Punch, and you’d be right. But the art of enhancement and experimentation is part of what makes cocktails fun, and I’m absolutely delighted that I finally got around to trying both of these handsome successes. So here’s to the courage, the inquisitiveness, and the inspiration of test pilots everywhere. Thank you, Hal! “Classic Tiki: the Jet Pilot” at cold-glass.com : All text and photos © 2016 Douglas M. Ford. All rights reserved. Definitely one of my favorites from the tiki canon.. I typically use Myers or Coruba for the dark Jamaican and Lemon Hart for the 151 but was interesting to switch it up with the Smith & Cross and Hamilton. On a side note, BG Reynolds makes a more than acceptable Jet Pilot mixer. I’m not typically one to buy prepared cocktail mixers but my curiosity got the better of me with this one and it’s great when I don’t have the time or inclination to get everything out. Alas! That I haven’t seen Lemon Hart in my region for the last couple years. The Hamilton makes a fine replacement. I’m glad you enjoyed Jet PIlot. Yes, I don’t know why I didn’t discover it before this. Hi, great drink, but how is this different from Donn”s rediscovered Zombie recipe -it appears to be the same.